A few notes on the polling methods. We are planning to move to a three day rolling poll where the fourth night is dropped from the averages in favour of the new day results. We have presented a four-day roll here but, as the campaign progresses, we will be increasing our daily sample sizes and move to a three-day roll. Tomorrow may show some influences of tonight’s debate, but the real test will be what we see on Thursday, after the results of the debate have parsed and mediated by the public and pundits alike. 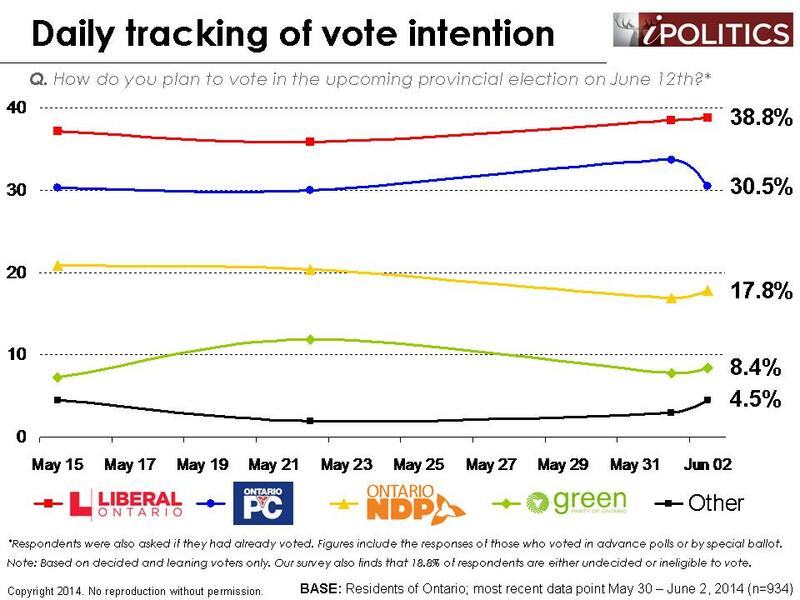 If we don’t see much change by Thursday, this will begin to point to a pretty clear Liberal path to victory. Frankly, we don’t think the debates are typically that influential in qualitatively altering an election outcome. Despite being the most watched spectacle, they rarely alter the outcome of political campaigns on Election Day. There is, however, one major wild card still at play, and that is the critical issue of turnout. Because we do not yet have enough cases to generate statistically reliable likely voter results (we ultimately throw out the half of the sample who are most likely to not vote), we will not be reporting on this until later in the week. Our model is a multi-variate index which relates past proxies for turnout to guess who will show up. It combines past voting behaviour, commitment, knowledge of polling station location, and likelihood of making it to the polling station to try and divide the sample into likely and unlikely voters. We acknowledge that this is a pretty hazardous exercise, but it is impossible to ignore this aspect of the campaign, particularly in an era of low and possibly declining participation rates. We predict that the continued stubborn and high indecision is not the typical indecision of the apathetic or weakly engaged. Some of it is a reflection of those parts of the population, but a larger part consists of voters who are genuinely conflicted by two equally appealing – or perhaps more unappealing – alternatives. The longer that these voters remain stuck between the rock and hard place of the Liberal and Progressive Conservative offerings, the greater the chances they will stay home. While the demographics fluctuate to a certain extent with each poll, the overall trend seems to be one of stability. 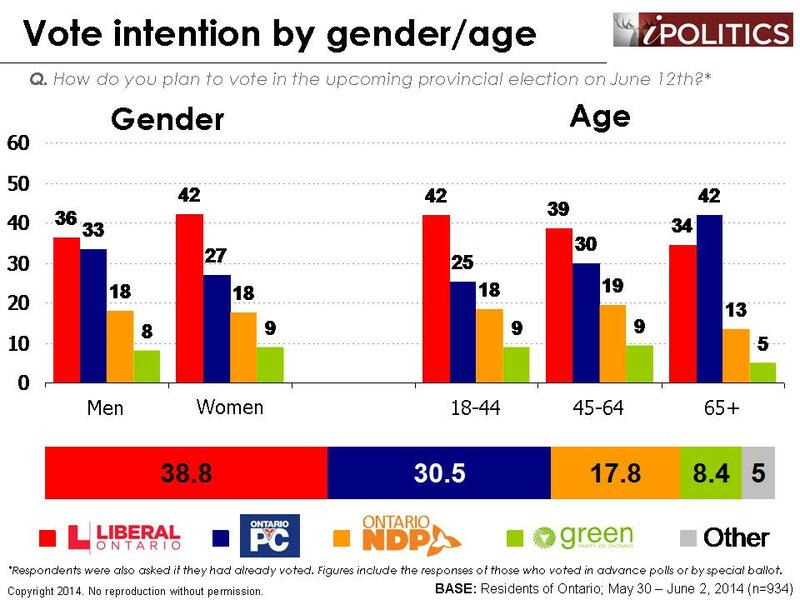 The Liberals appear to be increasing their advantage with younger voters and are holding a steady lead among those ages 45-64. Seniors, meanwhile, continue to lean towards the PCs. Regionally, the core GTA remains a Liberal stronghold, but there is some evidence the PCs have made gains in Southwestern Ontario. 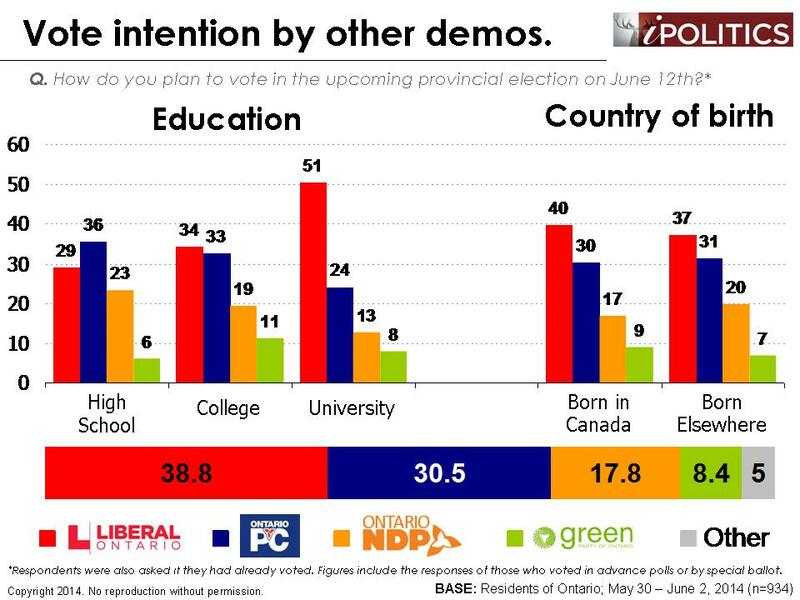 The University educated cohort has remained a reliable source of support for the Liberals throughout the campaign, while the college educated have been split between the Liberals and the PCs. High school graduates have moved around quite a bit and all three parties seem to be competitive here. Too much conservatism at once? We have a number of diagnostic tools that we are using to enhance our understanding of the late stage campaign dynamics. Yesterday, we shared our tracking of the impact of one dimension of emotional engagement. Today, we present a test which asks whether the presence of majority Conservative government in Ottawa dampens voters’ enthusiasm for a similarly striped PC government in Queen’s Park. 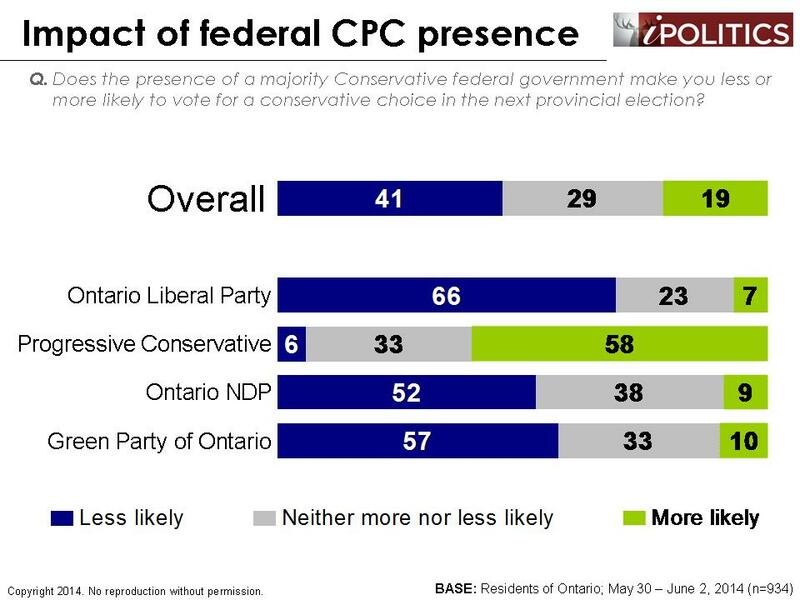 The results show that the public do believe this to be a factor with more than twice as many saying the presence of Harper’s Conservative government makes them less likely to vote PC in Ontario. 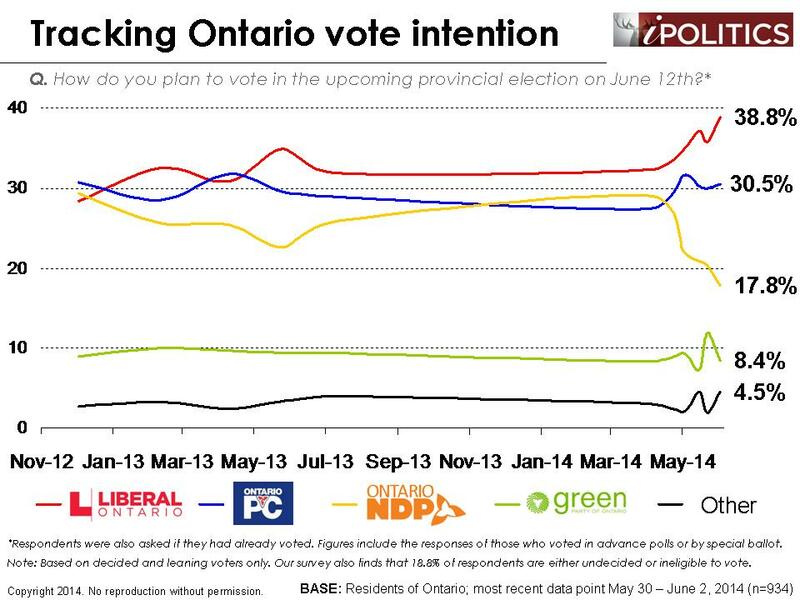 The effect is significant across the partisan spectrum but clearly strongest in the case of the Liberal supporters. It is mildly surprising that the NDP supporters, who are supposed to be even more ideologically distant from the conservatives than the Liberals are significantly less likely to factor this into their voting decisions. The field dates for this survey are May 30 – June 2, 2014. In total, a random sample of 934 Ontario residents aged 18 and over responded to the survey (including a sub-sample of 758 decided voters). The margin of error associated with the total sample is +/-3.2 percentage points, 19 times out of 20.